Electrification is a big theme at the 2017 LA Auto Show, and Porsche has presented a plug-in hybrid version of its four-door, four seat grand tourer. The Porsche Panamera 4 E-Hybrid Executive is the super saloon for the executive who cares about his carbon footprint, but it could also be the first Porsche you’ll be itching to be driven in, rather than drive yourself. That’s because the Executive badging alludes to this car’s extended wheelbase that affords rear passengers nearly six inches more legroom over the standard Panamera. The rear seats are heated and eight-way adjustable, there is a panoramic glass roof, plus Executive versions also come fitted with comfort-orientated air suspension and the Porsche Active Suspension Management system. 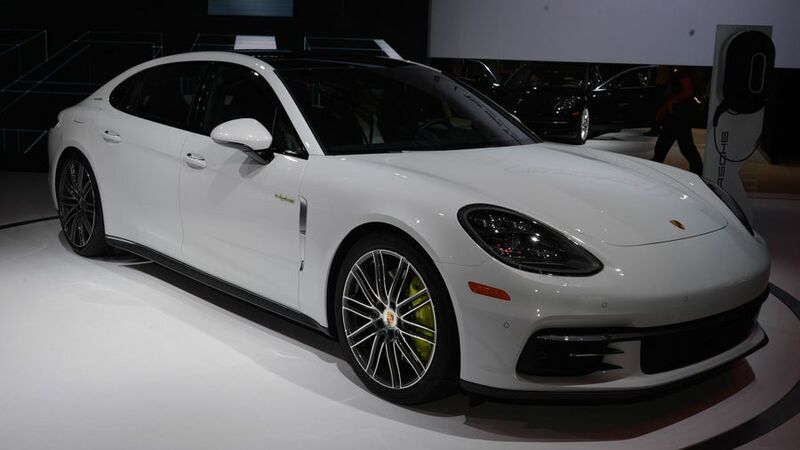 The Panamera 4 E-Hybrid, notable by its neon green brake calipers and badges, marries a 2.9-liter V-6 petrol engine with an electric motor to produce an estimated 455bhp. Fitted with an eight-speed PDK gearbox, it accelerates from 0-62mph in 4.7secs and has a top speed of 172mph. It also emits 56g/km of CO2, has a theoretical fuel economy of 94mpg, and an electric-only range of up to 31 miles. The Porsche Panamera 4 E-Hybrid Executive is priced from £84,838 and will be available to order in November, with UK deliveries beginning in early 2017. Interested in buying a Porsche Panamera?